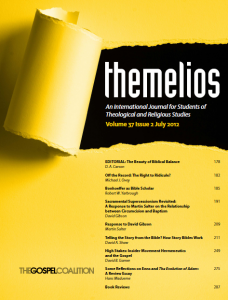 The current issue of the Gospel Coalition’s theological journal Themelios is now available as a free PDF download. This issue has 263 pages and includes 78 book reviews. I find book reviews one of the most stimulating sections of a Journal, since Themelios is now an electronic journal they can include a huge number of reviews without running up the cost of printing. You can download a PDF copy for offline reading, or read the Web version. Since I am preaching on this parable this weekend at Rush Creek, I have been reading quite a bit on Luke 18 lately. Jesus makes a clear contrast between two men, a Pharisee and a tax collector. Everyone knows Pharisees are good, religious people and the tax collectors are desperately sinful and greedy traitors. 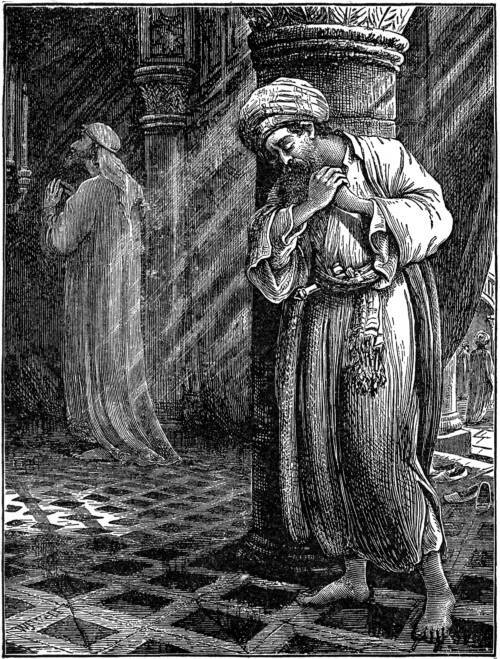 The twist in the parable is that the Pharisee does everything right from a religious perspective, yet does not “receive grace.” The tax collector is inept at religious duty and rather embarrassing in his inability to pray the right prayers. Both men in this story have a chance to receive grace from God, they have a chance to receive forgiveness and “go away justified.” Why does the Pharisee not forgiven? Jesus is not condemning the spiritual discipline and devotion of the Pharisee in this parable (or anywhere else, for that matter). In Verse 9, we are told that the parable is a response to “those that were confident in their own righteousness and looked down on everyone else.” The prefect participle πεποιθότας (pepoithotas) indicates they have been (already) convinced they are right with God. But they are not simply self-confident: they “despise” others. The verb ἐξουθενέω (exoutheneo) has the connotation of disdain, “to show by one’s attitude or manner of treatment that an entity has no merit or worth” (BAGD). Imagine a very wealthy person who treats the “help” poorly. The poor servants are not worthy of consideration at all, they care mistreated or simply ignored as people. This is the attitude of those Jesus targets with this parable. Jesus’ ministry is focused on these despised people, the outsiders and outcasts who are beneath consideration in polite society of religion of the first century. It is obvious that other Jewish teachers would love to see these outsiders return to covenant faithfulness and “get right with God.” The difference between Jesus and most religious groups in first-century Judea was that Jesus sat down and ate with sinners, showed them some respect, and forgave their sins. If the stories of rabbi Shammai reflect his character, he might have taken a stick to a person who came to him and asked “what must I do to be saved?” If someone did want to repent and they asked an Essene what was required, they would be given a fairly hefty Manual of Discipline and put on probation for three years! We are not told who the self-righteous in Luke 18 are, but the first group that comes to mind are the Pharisees. Jesus is questioned by a Pharisee in Luke 17:20, but the persons being taught in chapter 18 are the disciples. Jesus does not answer the Pharisee, but teaches his disciples in 17:22. In 18:1 the disciples are still the focus of the teaching. There may be no connection at all between the Pharisee of 17:20 and this parable. If this is true, then it is likely that there were a few disciples who were self-righteous, perhaps a bit arrogant because they knew since they were following Jesus, they were “right” and the Pharisees were wrong. The parable is not aimed at “those arrogant Pharisees over there,” but at Jesus’ closest followers, the inner circle of disciples who were appointed by Jesus himself. Instead of the imaginary legalistic Pharisee, Jesus is pointing his finger and Peter, James and John. He is telling them that they are not right with God just because they joined the right teacher or (finally) understood that Jesus is the Messiah. They too have to ask for mercy and experience the grace of God. Jesus’ parable also points a finger at us. Modern (American) Christians can be an arrogant lot. We think that we have been so close to God for so long that we (obviously) are the closest to God. Sinners need to shape up and be more like us if they want to be right with God. Instead of a Pharisee, or “those disciples back then,” put yourself in this parable – are you the Pharisee? You are not right with God because you gave up your sins, as if that is even possible. You are not right with God because you endured a particular religious ritual. You are not right with God because you kept the ten commandments for most of your life. You are not right with God because you are a good person. You are not “right with God” because you signed the right doctrinal statement or can quote the proper creed, or because you attend the right church, or because you have the best worship music, or because your book sold 20 million copies. You are not right with God because you don’t drink coffee at Starbucks, or because you do eat a particular chicken sandwich, or because you shoot guns, or you do not own guns, or you voted for the right candidate. 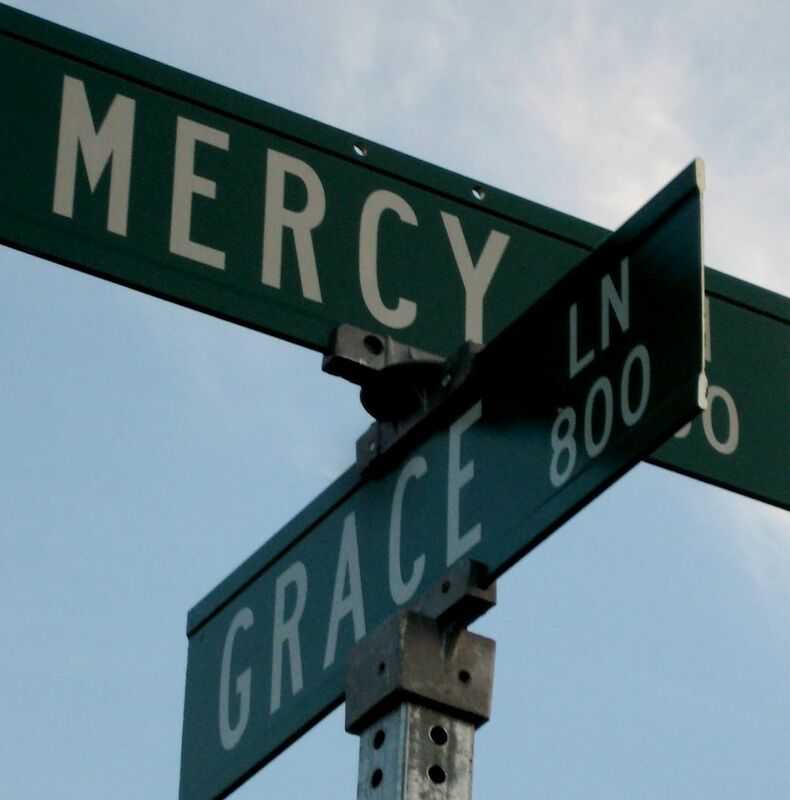 You are right with God because you asked for mercy and experienced his grace. Jim Barr from BibleWorks sent me a link to a video demo of BibleWorks 9 running on a Windows 8 Tablet PC (Samsung Series 7 Slate). The demo of BibleWorks does not really start until 2:30 into the video, but do not miss the joke at 2:20. Windows Tablets have more surface than the iPad, so the work-space will look much more like your desktop. When I use Logos on the iPad, it is a completely different program, with stripped down features. BibleWorks appears to be the same basic program on the tablet, since it is still running under Windows. 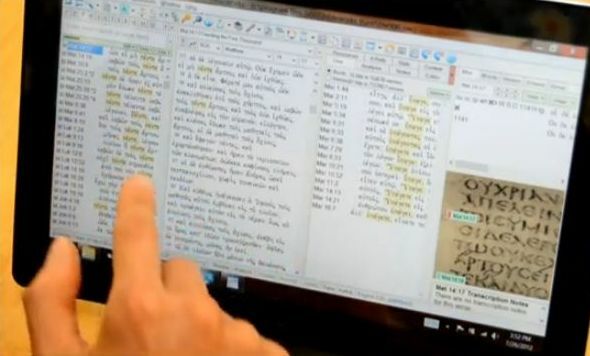 I particularly like the manuscript viewer in the corner, a feature not found in other Bible programs. Hopefully I will be able to write a full review of the program in the future. 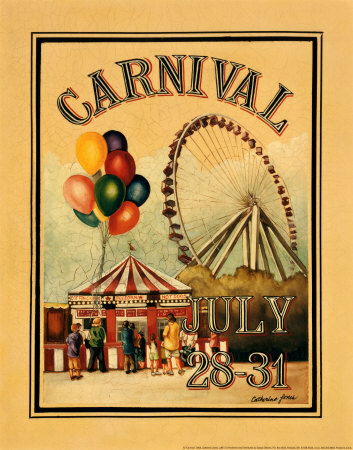 Reading Acts is hosting the July Biblical Studies Carnival! This is big news, at least to people who read BiblioBlogs. If you do not know what a Biblical Studies Carnival is, head on over to Political Jesus for the June Carnival, or an equally grand carnival at Kata Markon. A carnival is a way to give some well deserved recognition to people who are doing great work on their blog. Who are you regularly reading? What posts are provocative, interesting, or just plain funny? This is a second “call for links” to blogs of significance posted in the month of July. I will take links right up until 7/31, but the sooner you nominate a blog, the more likely I will include it in the carnival. Email me directly at plong42 -at- gmail.com, with the words “biblical carnival” in the subject. I have a good list already, but feel free to make suggests. Self-nominations are acceptable, if you do not toot your own horn it might not every get tooted. Or something like that. A second Blog-Carnival related request: Jim Linville has given up the joy of organizing the blog-carnivals, so I volunteered to organize them through the end of the year. I need volunteers to take a month, starting with August (to be posted about September 1) through December. Please email me with your preferred month. Why should you host a carnival on your Blog? Aside from the obvious fame and fortune associated with Carnival hosting, it is a chance to highlight blogs which you find helpful contributions to the world of Bibliblogging. If you are relatively new biblioblogger, this is a chance to drive some traffic to your own blog as well. Biblical Studies Carnival, Carnival, Huzzah! Introduction. 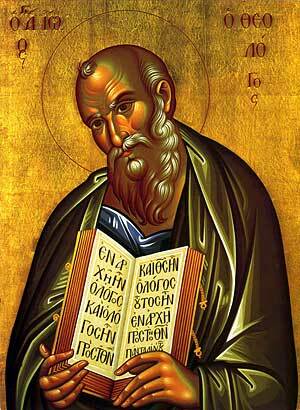 Commentaries on James necessarily must deal with the potential conflict between James and Paul. This is a well known problem, since James says that faith without works is dead (James ) while Paul says that one is justified by faith, not by good works. There are a number of later apocryphal stories which develop this conflict well beyond the biblical data. The reformation stream of Christianity struggled with James, Luther’s disdain for the book is an example of a preference for Pauline theology over and above James. Another issue with James is the genre. The book is very loosely structured, almost as if it is a compilation of sayings and short teachings rather than a book with a clear argument. (Again, this is in contrast to Paul’s style of writing.) Many commentaries observe that James is not unlike the book of Proverbs, but few develop this idea that much because (in truth) it is not that much like Proverbs! One option is to read James as a late-compilation of James’s sayings, written after his death in the mid-60’s A.D. My preference is to read this book as very early, perhaps predating Paul (or at least written at the same time as Galatians or Thessalonians). I should mention a couple of other books which I have found helpful for studying James. Bruce Chilton and Jacob Neusner edited a volume of essays on James: The Brother of Jesus (Louisville: Westminster John Knox: 2001). Richard Bauckham’s essay in this book James and Jesus is excellent, and I have found Craig Evans’s article on James and Qumran very helpful. John Painter’s Just James (Minneapolis: Fortress, 1999) is a highly detailed monograph on James in Christian tradition, beginning with Acts and Paul, then Eusebius, Nag Hammadi, and the Christian Apocrypha. Painter concludes with a brief review of the idiosyncratic James, The Brother of the Lord by Robert Eisenman. Eisenman’s book is massive and develops a view that Paul and James represent a major rift in the earliest church. I am not convinced by Eisenman, but the book is an interesting read. Luke Timothy Johnson, The Letter of James (AB; New York: Doubleday, 1995). Johnson’s commentary replaced the rather slender volume by Bo Reicke (remarkable for including the epistles of Peter and Jude in a mere 221 pages!) By contrast, Johnson’s commentary begins with 164 pages of introduction to the letter of James alone. In fact, the introduction is worth the price of the book. I find his description of the similarities and differences between Paul and James helpful, concluding that the contrast is distorted by focusing on a single topic (justification by faith). Johnson dates the book early, written by a Jewish Christian in Palestine who had access to an early form of Jesus tradition (perhaps Q). The introduction has a long section on history of interpretation, asking the question, “How was the voice of James heard” by the church?” The commentary itself is based on the Greek text, but all Greek is transliterated. All citations in the commentary portion are in-text. Johnson draws parallels to Second Temple Period Jewish literature as well as Greco-Roman moralists. As with most of the recent volumes in the Anchor series, John includes detailed bibliographies at the end of each section, including German and French scholarship. Scot McKnight, James (NICNT; Grand Rapids, Mich.: Eerdmans, 2011). Scot McKnight is an unusual in that he is a respected biblical scholar yet is able to write with a pastor’s heart on topics which speak to important contemporary issues. McKnight’s commentary is another excellent contribution to the NICNT series, replacing James Adamson’s 1976 volume. While Adamson is still a useful commentary, McKnight’s contribution goes far beyond what the NICNT series expected thirty-five years ago. After a brief introduction (55 pages, defending a generally traditional view of the letter), the commentary proceeds phrase by phrase, Greek appears in transliteration, but in footnotes it is not. Most of these notes are lexical or textual. McKnight fully develops the wisdom-aspect of the letter of James, occasionally citing at length parallels to Jewish wisdom drawn from the Hebrew Bible, especially Proverbs but also Sirach. He has a short excursus on Paul and James, concluding that James is responding to Paul (or some of Paul’s early followers who distorted Paul’s teaching). As with most of McKnight’s work, this is a very readable commentary. While readers familiar only with The Jesus Creed will find McKnight’s scholarship taxing, this commentary will be the “first off the shelf” for many years to come. Ralph P. Martin, James (WBC; Dallas: Word, 1988). The introduction to the book of James is about one-third of the book, and well worth reading despite being a bit dated. Martin sees a two-stage process for the production of the letter, first a collection of sayings going back to “James the Jerusalem Martyr” was made. These sayings were then edited (polished?) by a Hellenistic writer to produce the letter as we have it. This accounts for the Jewish / Wisdom aspects of the books as well as the Hellenistic / Moralists aspects. Martin’s commentary is one of the better on this list for treating the Greek text. Throughout the commentary the Greek is cited (without transliteration), Martin comments on both lexical and syntactical elements of the text. The Word series concludes each commentary section with an “Explanation,” here Martin draws on his exegesis to draw theological and pastoral conclusions. Douglas Moo, James (PNTC; Grand Rapids, Mich.: Eerdmans, 2000) and James (Downers Grove: Intervarsity, 1985, 2009). Doug Moo wrote the replacement in the Tyndale New Testament commentary on James in 1985 (originally published by Eerdmans, now Intervarsity). This little commentary is very handy, treating Greek in transliteration and dealing with the more controversial issues only briefly. His more recent Pillar Commentary is much more substantial, developing his arguments for the traditional view that James was written by the Lord’s brother in the mid-40’s in more detail. I find his section on the theology of James quite helpful since it goes beyond the usual “works vs. faith” issue. The body of the commentary proceeds phrase by phrase, treating Greek in transliteration. Moo judiciously draws parallels to other Second Temple Period literature, showing that James stands in the Jewish tradition without cluttering the commentary with external sources. The text is quite readable, making this an ideal commentary for the busy pastor preparing to preach through James. Peter H. Davids, James (NIBC; Peabody, Mass. : Hendrickson, 1989). I have not included any commentaries from this series (originally published by Hendrickson, now by Baker). They are handy paperback volumes, inexpensive yet usually good for preparing a sermon. This slender commentary includes Davids’s article on the Theology of James first published in JETS in 1980. The body of the commentary is based on the NIV, although there are “additional notes” dealing with aspects of the Greek text (in transliteration). Davids includes parallels to Jewish literature in these notes, which strike me as more lengthy than other commentaries in the series. Conclusion. There are a few missing – Blomberg and Kamell in the new Zondervan Exegetical Series should be mentioned, but I do not have a copy to review. What else is missing? 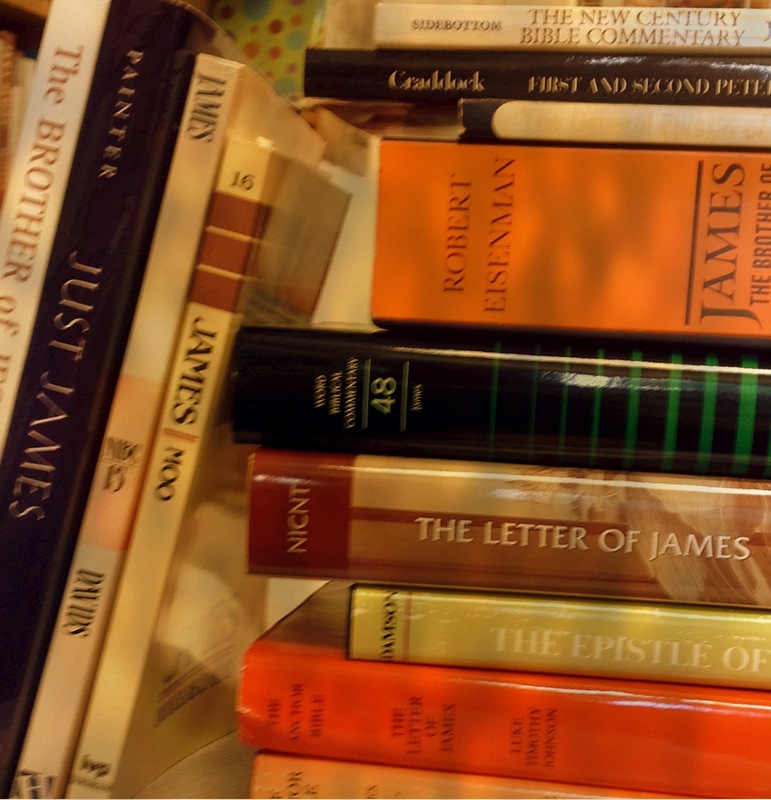 What is the classic commentary on James which ought to be on every scholar’s shelf? What have you found useful in your teaching of James? 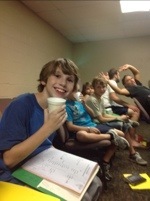 I am currently teaching at West Coast Grace Youth Camp, Mount Palomar, California. It is a beautiful sot for a camp, and the people that run the camp give the kids a great week of fun, worship and Bible study. My “task” is teaching 18 college students who will be counsellors next year. I did this last summer as well and had a great time, this year’s group has a lot of potential A few of them would make great counsellors now, but I like the fact that they would like to have a bit more “training” before taking on a cabin of 5th graders. This year’s camp has been plagued by difficulties which seem to be more complicated that previous years. We have had some discipline problems and a scare with a potentially serious injury, and one of the boy’s cabins has had a little problem with bugs. Any one of these things would have the potential for hindering the ministry of the camp, but that has not happened. Everyone has been able to adapt, they have demonstrated patience, and worked hard to make cabin moves and cold showers less disruptive. On the other hand, the campers are extremely fervent in their worship times, As I type this, a group of campers have a guitar and are sining praise songs during their free time. Our Bible hours begin with an appropriate time of praise and worship music, but these are not the “camp chorus” type songs I grew up with. The worship leader has selected songs with rather deep lyrics. (They are almost entirely plagiarized from scripture, but that is not a bad thing in this case. I think they are all examples of intertextual blending of traditions material.) The band is loud, but the music is well mixed and the vocals are clear. I see most campers singing. The lyrics are of course projected on the wall, but they are in fact singing bits of Scripture, perhaps more scripture than they read on a daily basis. This puts enormous pressure on the worship leader. He must select good songs which the kids want to sing (fairly easy) but must ensure that the lyrics are “scripturally correct” (quite a challenge). There is a constant temptation to pick the popular song without really thinking about what is being sung. Fortunately, we have a worship leader who cares about that sort of thing. What does this mean for “doing ministry”? I have to be flexible, since the days of singing a few choruses then a 45 minute sermon twice a day are going away (or gone).